Are you a former member of the Kelso High Band? Do you remember the fun you had being a part of the Marching Band, or the amazing experiences you gained from Wind Ensemble, Concert Band or any of the many other instrumental music programs that Kelso High School has hosted over the years? 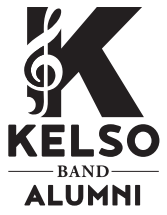 We would love for you to keep your connection to your musical past and become a part of the Kelso Band Alumni Group. As a member of the Kelso Band Alumni Group, you'll be informed of upcoming performances, advised of band news, and invited to the occasional alumni-only get together. As a thank you gift for joining the Kelso Band Alumni Group, we'll send you a free Kelso Band Alumni window sticker so you can continue to show your support and heritage to everyone. Please contact our Alumni Coordinator, Denise Estes, at alumni@kelsoband.org if you have any questions. To join the Kelso Band Alumni Group, simply complete the form below (we will not sell/share your information with anyone).